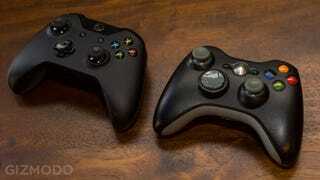 For all its flaws, I'm a pretty big fan of the Xbox One . But while the voice control can occasionally miss the mark and sometimes the Kinect won't recognize you, there's one thing that's flawless: that controller. And now Microsoft has released the drivers for download so you can use it on PC. I've been dreaming of this day for months. When I went off to college and said goodbye to my (family's) old-school desktop PC, the old, wired Xbox 360 controller became a huge part of my life. Almost like an old friend. I know the wear and tear on my trusty controller almost too well. I mean, who wants to whip out a Bluetooth mouse to play computer games which you can just plug in a controller, lean back, and go? OK, super competitive shooter players, but I am not one of those. And now, with controller support being more common than ever, the dream lives on. The only problem is that once I laid hands on the Xbox One controller, with its wonderfully little textured control sticks, I could never go back, which made playing controller-games on the PC a bit of a drag. But now that I can use the Xbox One controller? Oh man it's like so many games just got a breath of fresh air. I can't wait to sit down and play some Dustforce tonight. You can grab the drivers here to get in on some fun of your own.